Welcome to Troop 119's website! For any questions you may have regarding our Troop please use the "Contact Us" menu selection to the left to send us an email and we will get back to you as soon as possible. Thank you! Last Day to Record Advancement and Merit Badge Completions for Spring Court of Honor Recognition is Tomorrow - Tuesday, May 14, 2019. The May Court of Honor Ceremony will include recognition of advancements, Merit Badges and Rank Requirement items that are finalized by May 14, 2019. ** All Parents/Guardians are needed as volunteers during Troop Meeting time 7pm-8:30pm! Your Help is needed as the Final check-off for Rank Advancement. ALL PARENTS: Be available Parent at Troop Meetings for Scouts to meet with you and complete their Board of Review Rank requirement (Only Parents/Guardians can assist with Non-Related Scouts). Board of Reviews consist of 3 adult members including at least one committee member. 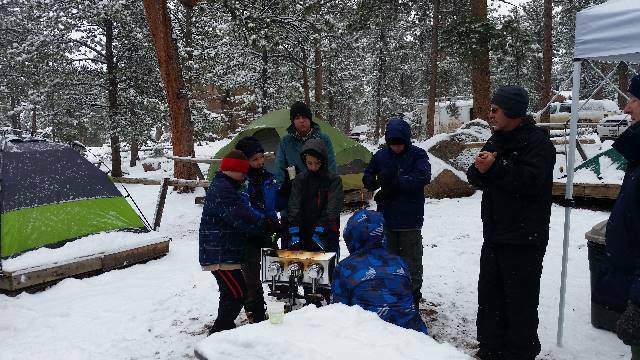 Parent Open House & Dessert - Brainstorming for Scouting Success Spring 2019 will be held March 26, 2019, during the regularly scheduled Troop Meeting in the Student Center (where Scouts usually meet), while the Scouts participate in their activities. Please plan to attend, enjoy Desserts while presenting your ideas/suggestions and brainstorming for activities and programs to implement or modify in order to support our Scouts in their individual and overall Troop success. The project is on Sunday, March 10 from 10 am to 4 pm. Please come join the Eagle Scout project to erect a flag pole for Liberty Common's track and field. We will be digging a hole for the flag pole and a concrete slab. Please bring digging tools that you may have as well work gloves and cloths for digging. Dress for the weather. Pizza, water, and a few snack will be supplied. Please sign up, I hope you can make it. If you need service project hours for a requirement or rank, this is the perfect time to do so. We will be making fleece blankets for children in the hospital. We will be going from 10 am to 2 pm. Snacks and drinks will be provided. ** MBU 2019 - Sign up by Court of Honor Tuesday 11/27/18** *Extended Registration may be available depending on remaining space availability. Hurry and Sign up on Troop Website Event and List TOP 3-4 Merit Badge Choices in the "comments" section (OR) Hand-Carry your MB Selections to Court of Honor. Merit Badge Classes fill up FAST. Merit Badge University is held each year in January (two Saturday mornings of the month) at Front Range Community College. Over 15 Merit Badge courses are offered. This is a great chance to work on Merit Badges in a fun environment with lots of other scouts! Spring Camporee - Danger - Aliens!